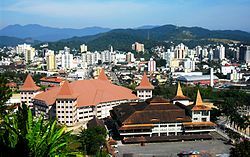 Brusque is a city in Santa Catarina, Brazil. It was founded in 1860, by 55 German immigrants. The majority of the population are descendants of Germans along with Italians and Poles. The city was originally called Colônia Itajahy, but on 17 January 1890 it was renamed Brusque after former Santa Catarina province president Francisco Carlos de Araújo Brusque. The official football team is Brusque Futebol Clube, founded on October 12, 1987. Brusque has a strong women's volleyball team in the Brazilian Super League. - The city is a pioneer in the invention of the voting machine, and the first polling station to use it was also in Brusque (1988). - First Latin American city to have public computers (1995). - Headquarters of the first spinning industry of Santa Catarina (1892 - Textile Factory Renaux). - Headquarters of the only English colony of Santa Catarina (1867). - The only city in Brazil to use chlorine dioxide to treat water consumed by the population. Current ethnic composition: 90% Whites; 5% Pardos; 4% Blacks; 0.5% Native American; 0.5% Asian. Original Population: 50% German; 30% Italian; 10% Portuguese; 9% African; 1% Asian. 80% Catolics; 15% Luterans; 4% Evangelicals; 1% Jehovah's Witness. Pacheca - entrepreneur of the transportation and entertainment business. ^ "O legado de Francisco Carlos de Araújo Brusque". Prefeitura de Brusque (in Portuguese). Archived from the original on 28 January 2016. Retrieved 23 January 2016. ^ "Brusque Futebol Clube" (in Portuguese). Arquivo de Clubes. Archived from the original on 2013-01-03. Retrieved 2008-12-07. This Santa Catarina, Brazil location article is a stub. You can help Wikipedia by expanding it. This page was last edited on 22 April 2019, at 14:22 (UTC).